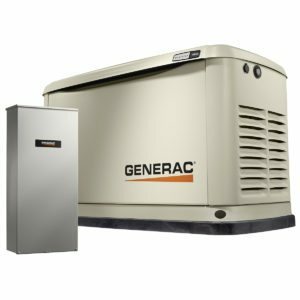 The purchase of a Generac backup generator will give you peace of mind for years to come, but it’s a big investment. That is why we want to give you as much information as possible so you can make the right decision based on your needs and budget. Contact us to so we can help you understand how the entire process works, what your financing options are, and how to choose the right backup power solution. This 11 kW Generac generator provides essential circuit or managed whole house protection for your home, ensuring the necessities remain powered during an outage. This affordable automatic standby generator offers protection for about half the cost of central air conditioning.